One of the greatest programmes run by the Writivism Literary Initiative is the Online Mentoring Programme for emerging writers across Africa. This programme results in a comprehensive list of stories that are published in an anthology like the one you are reading. As the Centre for African Cultural Excellence (CACE) states, the purpose of the programme is to provide “online mentoring to emerging writers of fiction and creative nonfiction” by connecting them with a mentor “who will provide feedback on how [their] work can be improved.” Having worked as a mentor, I know the work involved, which, when done with the mutual co-operation between mentor and mentee, often leads to a well-crafted story. I was not surprised then that most of the stories in this volume came to me with an edited feel to them; they were truly “mentored” stories. My job then was to solidify what work had already been started. The writers, most of whom already understood the purpose of revision and editing, were easy to work with. There is nothing as valuable a writer’s understanding of the amount of work a story requires before it becomes publishable. One of the writers whose work had been selected for the anthology used this kind of understanding to withdraw the story from inclusion in the final product, after determining that it would need a lot more work before the publication deadline: that level of humility and respect for the value of mentorship is commendable, and if there is one thing that the mentoring programme can continue to bring to the writer, it is an understanding of the process of writing—drafting, revising, editing— until the story is in its best shape. Transcending the Flame is a collection of works of fiction and nonfiction by eighteen writers. It is dedicated to Joel Benjamin Ntwatwa, who died in February, 2018 right around the time when the editing of the anthology had begun; thus, I didn’t get a chance to send him my feedback on the story. Given the role he played in the Ugandan arts scene, and especially in Writivism, the programme has decided to honour him through this work. His story, “Jaundiced”, which was longlisted for the 2017 Writivism Short Story Prize, portrays the ravages of the same terminal illness that killed him. I discovered that in addition to this story, Joel, popularly known as Nevender in Uganda, had published a book of poetry, Pumpkin Soup and Other Poems, which is available on Amazon Kindle. Some of the poems in this collection show what Joel thought about his illness and the eventual, inevitable end, but even then, there was hope (even a celebratory tone) about life. He didn’t let the illness affect his love for life and his joy in producing and promoting the creative arts. In short, he was, and will remain, an inspiration to many. His work is immortalized through the present anthology, his blogs, columns, nonfiction publications, his poetry and through the memories of his colleagues at Writivism and all the communities he touched. Each time I have had an opportunity to edit a Writivism anthology, I have learned more about the direction African literature is taking. Of course, no one anthology represents the whole literature of a continent, but I have edited several African anthologies and have been involved in screening prize submissions, judging competitions, and publishing some of the works on Munyori Literary Journal. There is a major shift in the range of issues that the writers are exploring. In fact, their work strikes me as courageous in its ready departure from established conventions of African literature, both in form and content. 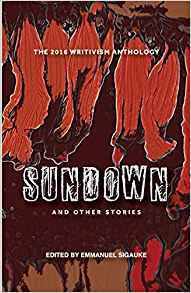 The stories in this anthology, for instance, cover eclectic themes and genres—everything from speculative fiction, fantasy, science fiction, literary, romance, horror and, of course, innovative nonfiction. Through these stories, one also sees that the writers are witnesses of their times: the influence of social media is evident; redefining techniques such as dialogue, plot, point of view, and others. Some of the dialogue comes with WhatsApp or Facebook Messenger messages as forms of conversation on the page, capturing the new realism of our times. Dynamic characters abound in the fiction pieces. Beyond that, the narrators grip, and sometimes shock, us with their unique voices. One boy remembers his father who died fighting for freedom in South Africa and is commemorated through a street named after him. In the title story, the narrator transforms his practice of arson to a regenerative act of birthing, where he sees flames as his children. In another story, a church leader who has always desired to be an inventor uses money from the church to invent a device that will eradicate traffic accidents in Nigerian cities. Characters in these stories fall in love across colour and gender lines, and sometimes the boundary between realism and fantasy blurs, helping the reader to suspend disbelief urgently in order to appreciate the creativity in the work. Here again is evidence that the short story form in the hands of emerging African writers is thriving, and what’s needed are programmes and resources to tap into this talent and help the writers establish their publishing profiles. The Writivism Online Mentoring Programme is definitely an important part of the process, and while one book alone cannot account for all the talent available on the continent, its publication, along with other related publications, is one of many resources that should be available for Africa’s emerging writers. I love what Writivism stands for, what it brings to African writers and what African writers bring to it. Transcending the Flame, the Writivism Mentoring Anthology is published by Black Letter Media, available in as an ebook, at 1800 hours Central African Time.